Dell got CES 2018 started early when it debuted its fully redesigned flagship ultraportable last week. 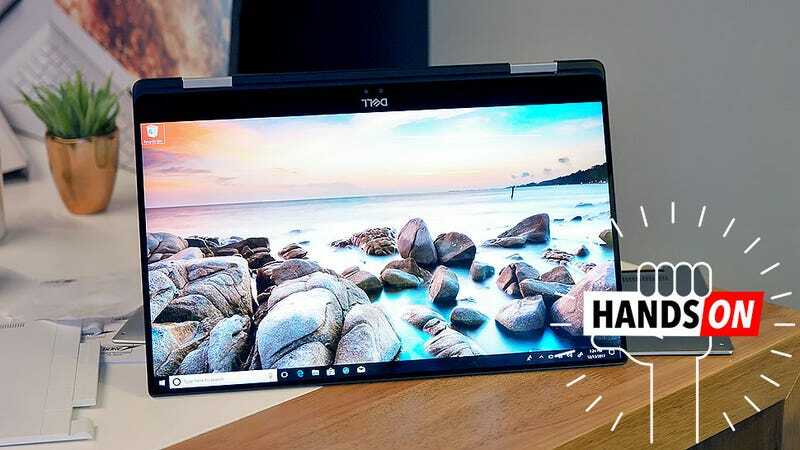 But the XPS 13 isn’t the only new premium system the company is showing off, and in some ways, it might not even be the most exciting, because now for the first time ever, there’s a 2-in-1 version of the XPS 15. By adding a 360-degree hinge to the previous XPS 15 chassis, Dell has created what it’s calling is the smallest, thinnest, and most powerful 15-inch 2-in-1 ever created. Now that’s an awfully lofty claim, but after getting the chance to play around with one for a little bit, it’s not that far off base. Packing components including the latest Intel 8th gen CPUs, built-in microSD card reader, an optional 4K touchscreen that covers 100 percent of the Adobe RGB color spectrum, along with AMD’s recently announced RX Vega M GPU, it’s clear that Dell is looking to take down Apple’s 15-inch MacBook Pro. Measuring just 0.62 inches thick, the XPS 15 2-in-1 is barely larger than Apple’s MacBook Pro 15 clamshell which comes in at 0.59-inches, and it’s way thinner than the 0.9-inch 15-inch Surface Book 2. And unlike the MacBook, the XPS 15 2-in-1 also features stylus support with 4,096 levels of pressure sensitivity. But perhaps the XPs 15 2-in-1's biggest advantage is its new maglev keyboard, which in my brief time with the system, feels even better than typing on Dell’s XPS 13, and a infinity more pleasing than the stiff, super shallow keys you get on a modern MacBook. You also get plenty of connectivity, including four USB-C ports (two of which support Thunderbolt 3), and a 75 WHr battery that Dell says should last up to 15 hours on a charge. With specs like this, Dell seems to be getting dangerously close to producing an ideal all-rounder. It’s the got flexibility to adjust you varying work modes, more than enough graphics power to edit videos or even play games away from home, and chassis thin and light enough to not make you hate carrying it around. That said, there’s still one compromise that frustrates that hell out of me. Like on the new XPS 13, the XPS 15 2-in-1‘s dual cameras are located below the screen, as Dell’s Infinity Edge display doesn’t enough room to put it in the proper location. That means anyone on the other side of a video chat will be graced with an unflattering view looking up at the bottom of your chin. I guess there really is no such thing as a perfect laptop. I also have a feeling that the Nvidia GTX 1060 in a top-end Surface Book 2 will also slightly outperform AMD’s RX Vega M graphics—though you have to remember a fully loaded Surface Book 2 is ridiculously expensive. The XPS 15 will be available sometime this spring, starting at $1,300 with a 15-inch full HD touch display, Intel i5 CPU, 8GB of RAM, and 128GB of RAM and Radeon RX Vega M GPU with 4GB of dedicated high-bandwith memory. We’re live on the ground in Las Vegas at CES 2018! Click here to read our complete coverage.